Paying a toll to get around traffic and how to pay for Metro are the major issues for the next year in the transportation world. News4's Adam Tuss reports. Paying a toll to get around traffic and how to pay for Metro are the major issues for the next year in the transportation world. From Interstate 66 in northern Virginia to Interstate 270 and the Baltimore Washington Parkway in Maryland to the Capital Beltway surrounding Washington, D.C., 2018 is going to be a year filled with huge transportation projects. The District will also content with finding funding for Metro. 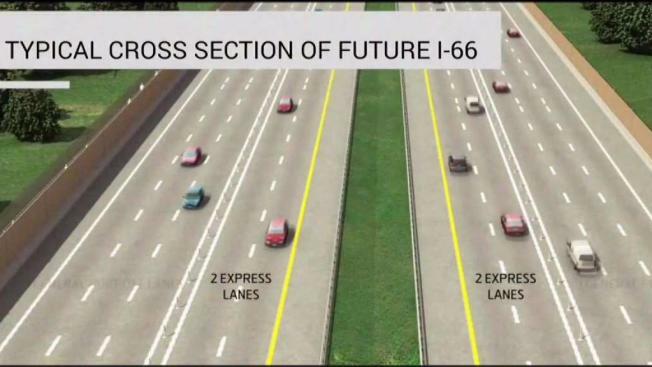 Along I-66, expect to see major construction from Gainesville, Virginia to the Capital Beltway as new express toll lanes are added. Two new lanes in each direction will run alongside three regular lanes. It is a massive project that will create big construction headaches, and the construction will last four more years. In Maryland, Gov. Larry Hogan wants to get several major transportation projects off the ground. He has proposed express toll lanes along the I-270 corridor, the Maryland side of the Beltway and the B-W Parkway, with two new toll lanes in each direction of those roads. It's still not clear exactly how long it would take to build these projects, but the state is confident they will be done. For Metro, the general manager has unveiled a budget that calls for no fare hikes and no service cuts but required $165 million more from jurisdictions to help fund the system. Metro said other than maintenance, most of the new funding it gets in 2018 will go toward buying more of those new 7000-series rail cars, which are also supposed to provide a safer ride.